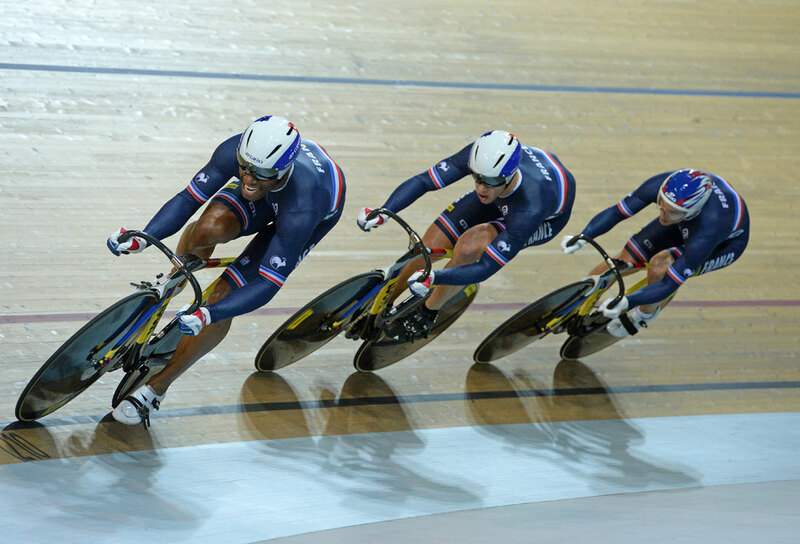 French team sprint trio. Second fastest team, but they win the world title, much to the delight of the home fans. 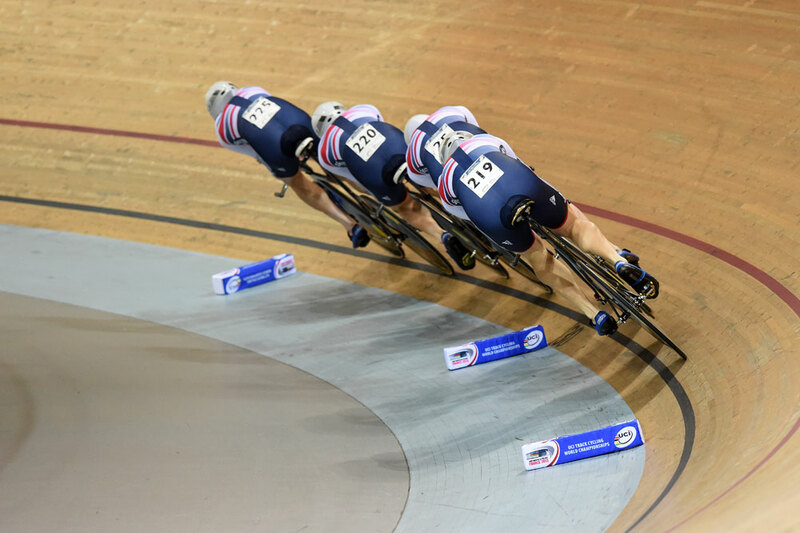 Both of Britain’s team pursuit squads made it safely through qualifying on day one of the UCI Track Cycling World Championships in Saint Quentin en Yvelines, near Paris. Britain’s men leapt back up the standings 12 months on from a poor performance in Colombia to post the second fastest time behind New Zealand. Britain’s women also qualified second fastest, beaten, somewhat surprisingly, by Australia by just seven hundredths of a second. There was however no panic in the British camp. 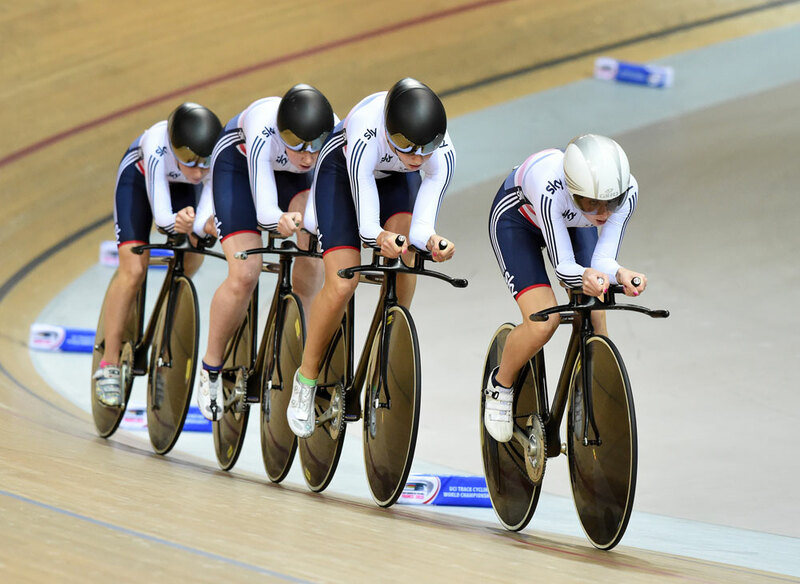 There should be more to come from their dominant female quartet with two more rounds of racing to come before the team pursuit medals are decided. Thanks to a fast track, both the Australians and British teams posted what look like the quickest two times ever ridden at sea level over four kilometres. The Paris track is as close to a full circle as you’ll see in international track competition, with almost negligible straights and big wide bankings. This almost circular design smooths out the transition from straight to banking, which favours pursuiters who aren’t hit by such hard g-forces every time they ride in and out of the bankings. If conditions are right, the world record could go tomorrow. 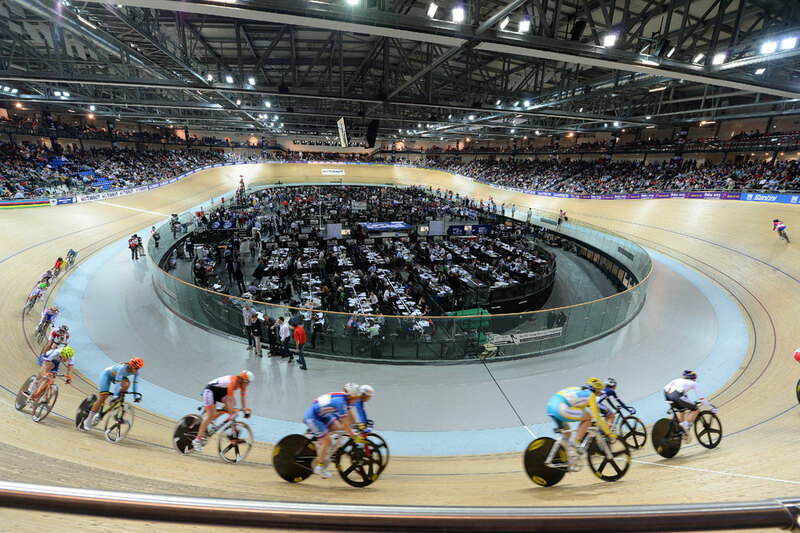 Any would-be Hour Record riders take note — this could be the track on which to make an attempt. Britain’s men posted their fastest time since the London 2012 Olympics with a three minute 57 second ride. They were one of six teams to dip under the four minute mark. Reigning champions Australia hit problems almost straight away. A crank bolt snapped on Luke Davison’s bike leaving his right leg flailing in the air, which was immediately followed by a rear wheel puncture for Alexander Edmondson. Edmondson slowed down coming in to the first turn, causing Mitchell Mulhern to clip his wheel and then crash. They got a restart but then went out too fast and only qualified in fifth place, and so won’t get the chance to defend their title on day two. Germany landed the first gold medal of the 2015 world championships courtesy of Stephanie Pohl in the women’s points race. It was also of note for being the first international bike race to feature a live feed from a camera on a participant’s bike. Silver medalist last year, Pohl took a step up the podium with a competent display that saw her finish ten points clear of Uwano Minami of Japan. Watch highlights of the on board footage below. 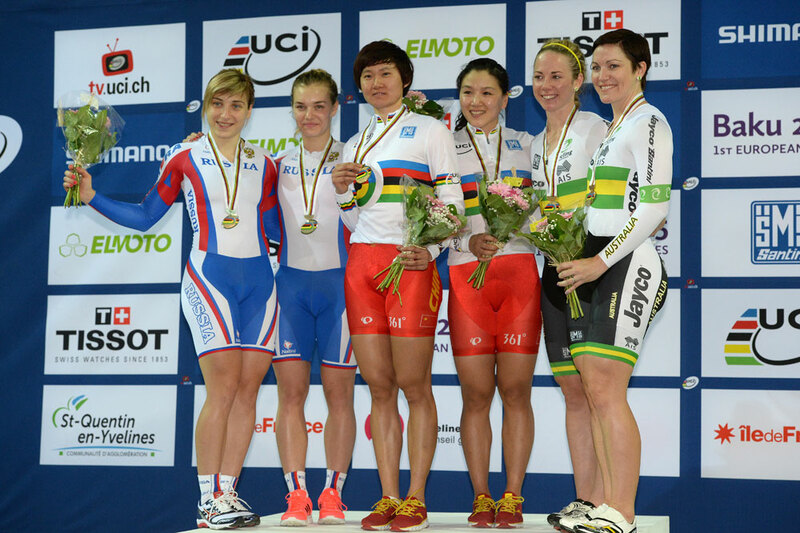 China then followed with a record breaking ride in the women’s team sprint. Jinjie Gong and Tianshi Zhong stopped the clock at 32.034 seconds to claim gold ahead of Russia and set a new world record in the event. 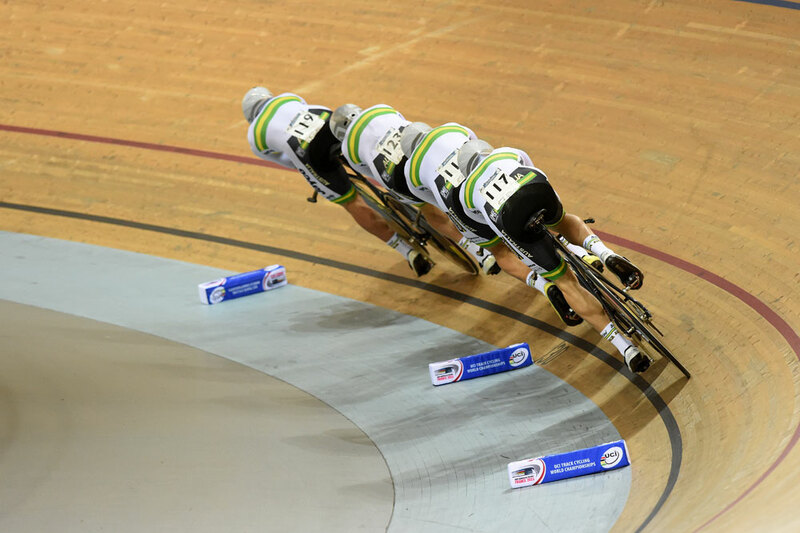 The fact that these two nations qualified ahead of Germany and Australia demonstrate the changing forces in women’s track cycling. China become only the fourth nation to win the women’s team sprint since the event was first introduced in 2007. France won their first gold medal at their new national home courtesy of a relegation. 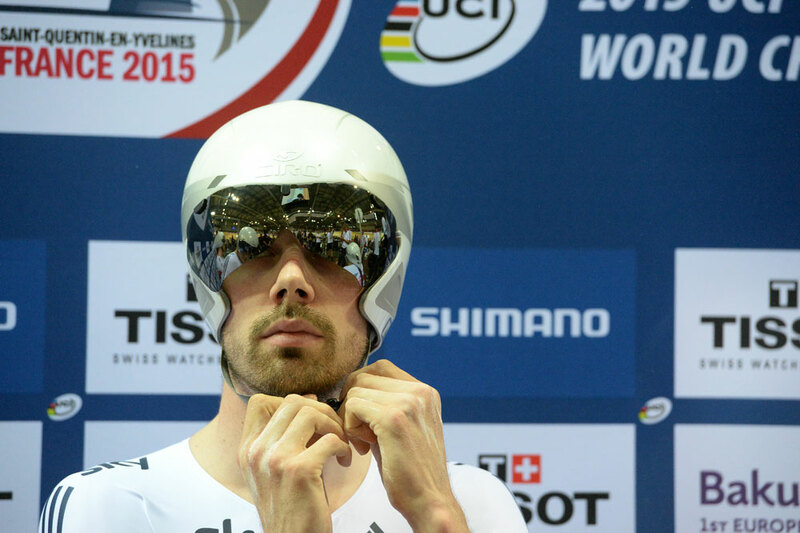 The New Zealand trio were faster round three laps of the track in the men’s team sprint but were relegated for an irregular change. The announcement was made as the Kiwis were celebrating on the track, holding their national flag above their shoulders. As the announcement was made in English, neither the French riders nor the home fans knew until several minutes later. Incredibly, for a team that dominated this event for years, it’s the first time the French have won the title since Pruskow 2009. 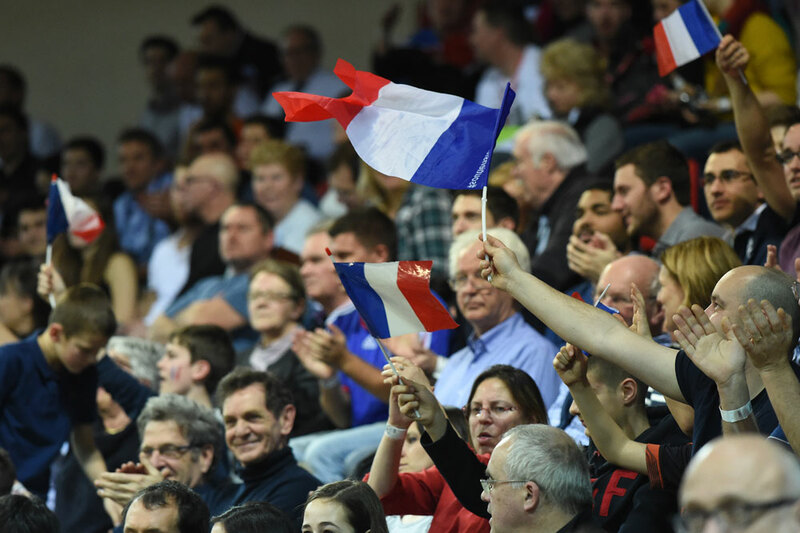 The home crowd celebrate as major track cycling returns to France for the first time since 2006 when Bordeaux hosted the worlds. The new track in Paris has already seen a new world record being set.